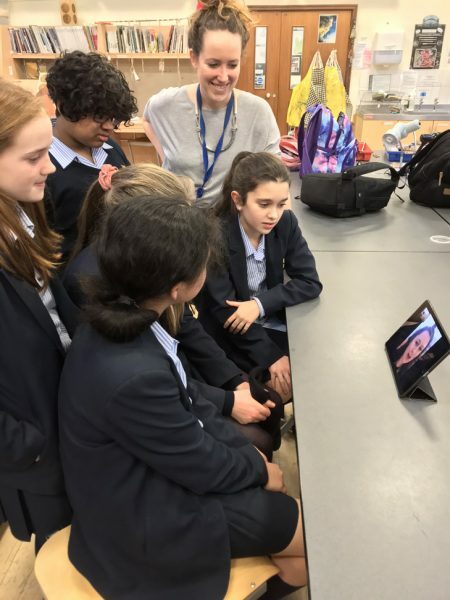 Miss Hannah Brown, Withington’s Arts Award Advisor, invited Rebecca to talk to current pupils, using Facetime. 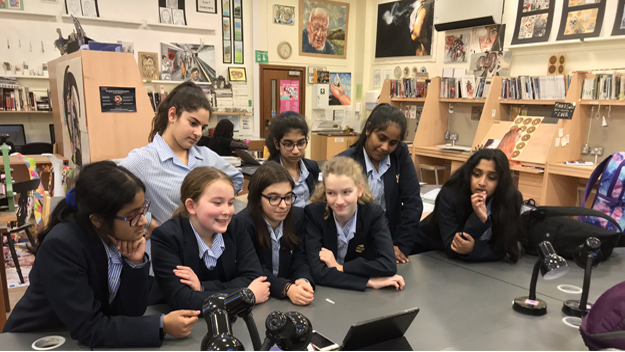 Girls participating in the Arts Award Silver course gathered around an iPad in the Art Room to hear Rebecca talk about her current role as editor and consultant for a new range of humorous children’s books. She introduced Year 8 girls to book designing and illustration, different print-run colours CMYK and Pantone, and explained how important it is to design great book covers which will catch buyers’ eyes on display. The girls were excited to hear about Rebecca’s role in producing a new book series about unicorns and ensuring each unicorn is illustrated perfectly, reflecting its own distinctive personality. The Arts Award pupils were also introduced to the concept of project planning and how it can take 18 months from manuscript to finished book. Rebecca patiently spoke to two groups of pupils, answering questions and showing illustrations from various books. Rebecca has over ten years’ experience in book editing and consulting, she writes her own blog, ‘How to Make Books’ and published her own website. She studied Classics at Oxford University and Master of Arts (MA) Publishing at City University London. The Arts Award programme has been running for several years for our Juniors, Year 7 and Year 8 pupils. It was launched by Hannah Brown at WGS for girls who are interested in Visual Arts and Crafts. Students taking part in the course explore the Arts as a participant through facilitated workshops, developing their own practice. They also experience one or more Arts events and take inspiration from Arts practitioners. They then share their new skills and knowledge by delivering their own workshops to their peers. Each section of the Arts Award programme documented in a personal Art log or portfolio that provides evidence of their journey throughout each course. 43 Junior pupils have recently completed their Arts Award Discover course. Many of these girls are now going to progress onto the Arts Award Explore course that runs over the Spring and Summer terms. Year 7 pupils meet every Monday evening to take part in the Bronze course. The current group have recently completed a series of textile artworks and they have taken inspiration from the School’s Centenary Tapestry by Artist Marta Rogoyska that was commission in 1990. Our Year 8 pupils who are enrolled onto the two-year Arts Award Silver course, have just completed their self-directed arts challenge. They have created artworks in lots of different ways based on the theme of a Natural Cabinet of Curiosities. They are now recording their creative journeys in their portfolios alongside researching arts practitioners and career options in creative industries. Once the girls have completed their Arts Award course, they will receive an Arts Council England accredited certificate. For more information regarding Arts Award opportunities, visit the Arts Award website, or alternatively email me via brownha@wgs.org and I will be more than happy to answer any questions. If you are a former pupil of Withington and would be interested in delivering a Q&A or presentation by Facetime or attend a class in person, please contact development@wgs.org for further information.